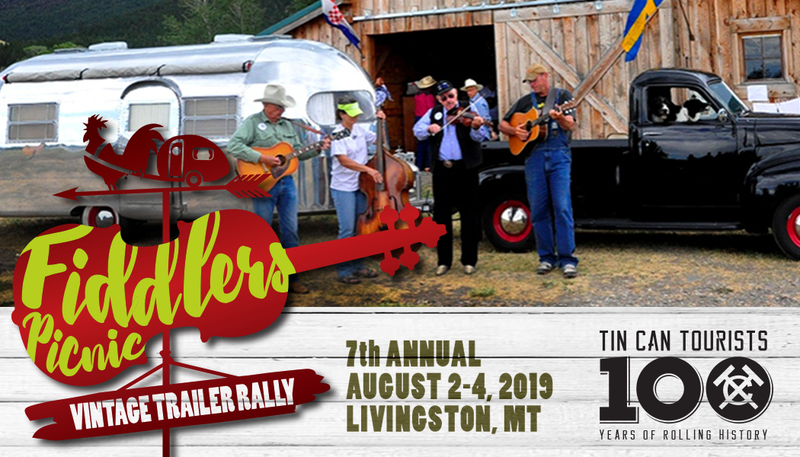 Join us for the 7th Annual Fiddlers Picnic Trailer Rally on the Old Mercier Ranch, just south of Livingston, MT, August 2 – 4. The rally is in the midst of the 45th annual Fiddlers Picnic — a joyous gathering of 500 pickers and their friends on the banks of the Yellowstone River. It celebrates the 109th anniversary of the Tin Can Tourists. The Picnic supplies the meat portion of the potluck lunch and a pancake breakfast. Its dry camping but close to amenities. Event decal to participants. $25 per trailer goes to support of the Picnic. Bring your instrument or just come and tap your toes.